Mom, the Intern: Rubbin' elbows with legends. Today, I had the pleasure of working with the meteorologists at the station. Steve Garry heard I did weather at BYU (his alma mater) and he wanted to show me the Weather Station, which was really cool. It's basically a bunch of computers that ingest weather information from satellites and allow the meteorologists to create their graphics, maps, etc. Very high-tech. While we were there, Sean McLaughlin came back and we started talking a little. And then, he complimented my bracelet. I know he's just a normal person, but I kind of had to pinch myself after that one. I've watched Sean do the weather since I was a child, when he was on Channel 12. 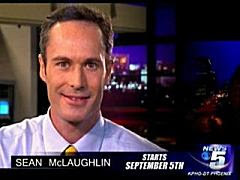 Then he went to big-time network news at MSNBC, and finally came back to CBS 5. He's a legend. Quite the seasoned meteorologist. And a great news anchor, too. Oh, and he's quite short, believe it or not. Don't worry; he admits this himself.